325m/min is the maximum belt speed the machine can reach when it is idle running. 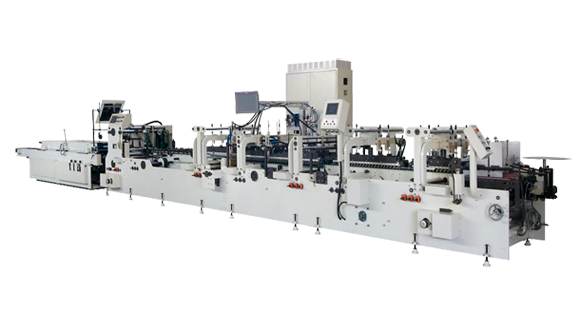 Actual working speed is subject to paper thickness, size, shape, quality and working environment, etc. • Ten individual adjustable feed belts ensure easy setup and smooth feeding. • 4. Belt pre-break device on right side only. • Upper belt can be repositioned to accommodate protruding panels. • Two sets conventional lower gluing pot (left and right side，6mm width) at final folding section. • Two sets Mechanical upper gluing wheel system (8mm width) can be applied (Optional). • Air-compressed cylinder system applied for corrugated board. • Upper carrier driving system installed. • Loosening only one bolt can change the position of belt guide wheel. • Extended the upper carrier to stable the delivery for wide boxes. • All the adjustment of heavy duty double frame trombone section can be made by hand wheel or handle, no other tool is needed. • Stopper device applied for making the front flap aligned. • 2-belt induction device is adjusted by motor. • Special longer conveyor designed for corrugated box pressing. • Upper belt width 25mm(0.98’’), lower belt width 35mm(1.38’’), positive drive. • Three-way quick release levers allow instant height setting of upper carriers. It’s easy to clear jams and running E flute or B flute cartons.